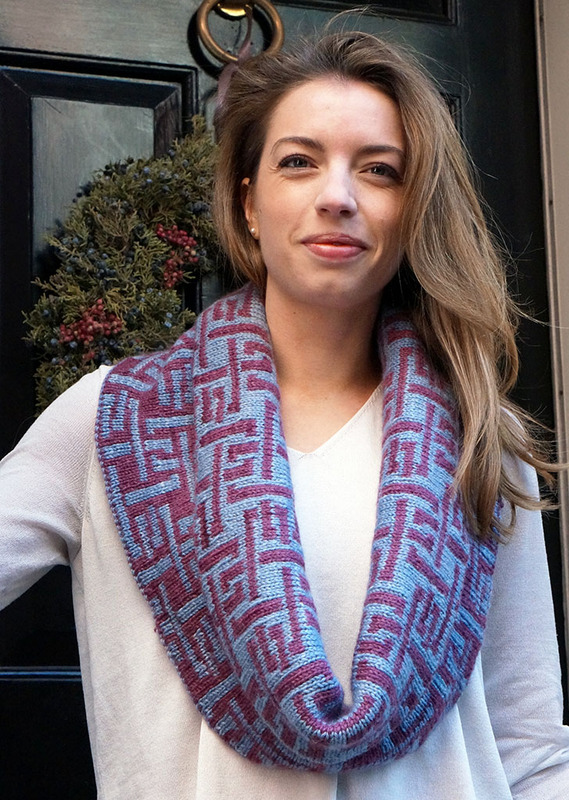 I had originally hoped to have all of the patterns in the new book finished — or at least knit — by the end of March. This lofty goal was thwarted by my teaching schedule — the last weekend of March (which was also the first weekend of April) was taken up largely by my crazy teaching weekend in Colorado and Tennessee. Now in case you were under the impression that knitting teachers have lots of downtime in which to work on projects between classes … we don’t. Most of the time, I’m anxious about my classes, or exhausted after my classes, or hungry, or just not feeling much like knitting after spending 6-9 hours in a day teaching it. However, I did get everything done about a week later. There is one pattern left to design and knit, and it’s not a huge loss if I don’t get it into the book, but I think it’s a possibility. If I succeed, I will model that one personally. Speaking of modeling, that’s where we are right now. Due to some faulty but fortuitous scheduling (not on my part) I have 3 weekends in a row before my next major gig at Vogue Knitting Live in Pasadena. Coincidentally, I have 3 models. As luck would have it, each of them has one particular weekend of the next 3 free. So while I can’t double up and save time, at least I have 3 chances to get the perfect shots. This past weekend, I was shooting with a model who is also a super-skilled knitter from one of my knitting groups. She was taken aback (in a good way) when I asked her to model for my upcoming book, and said she’s not really that photogenic. I was determined to prove her wrong. The photo above is far from the best shot I got of her, but it shows off the sample well. Aside from the model (who will remain nameless, by her choice, for now), you’re probably wondering about this piece she’s wearing. This is the first look at one of the new pieces in the book. I don’t mind showing it now because it’s not really groundbreaking — it’s just a big cowl. It is, however, the only piece I have without a name. The original name is awkward and doesn’t really suit it. Care to weigh in? What would you call it? It’s in Dirty Water Dyeworks Petite Clara. Next steps: More photoshoots and getting patterns together for tech editing. As you may have noticed, my workshop in NYC this past weekend was cancelled due to an unforeseen scheduling conflict on the venue’s part. Lion Brand Yarn Studio has moved my workshops to September 25th. That would have been Stitches Texas except that I wasn’t booked to teach there this year (sorry, Texans). My next gig is May 13-15 in Pasadena, CA — I’ll be teaching at Vogue Knitting Live there. I’m running 6 of my 7 classes there and there should be space in all of them. I’ve also just signed a contract with the Big Apple Knitters’ Guild, so if you’d like to take a class with me on July 30th, keep an eye on this space. Stay tuned — next month we’re going to start a new mailing list for the book and I’ll have some more news for you as we charge forward! Thanks for your interest — and your patience! Or, are there any IT/computer code, math or scientific associations with this design? Eager to see the new book!